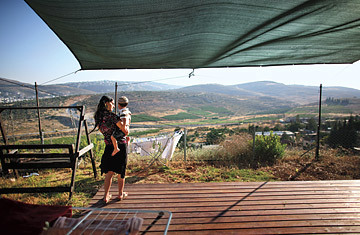 Jewish settler Einat a Bloch holds her neighbours son outside their home at the settlement of Shilo in the West Bank. In a hilltop suburb South of Jerusalem called Efrat, Sharon Katz serves a neat plate of sliced cake inside her five-bedroom house, surrounded by pomegranate, olive and citrus trees that she planted herself. She glances out the window at the hills where, she believes, David and Abraham once walked. "We are living in the biblical heartland," she sighs.